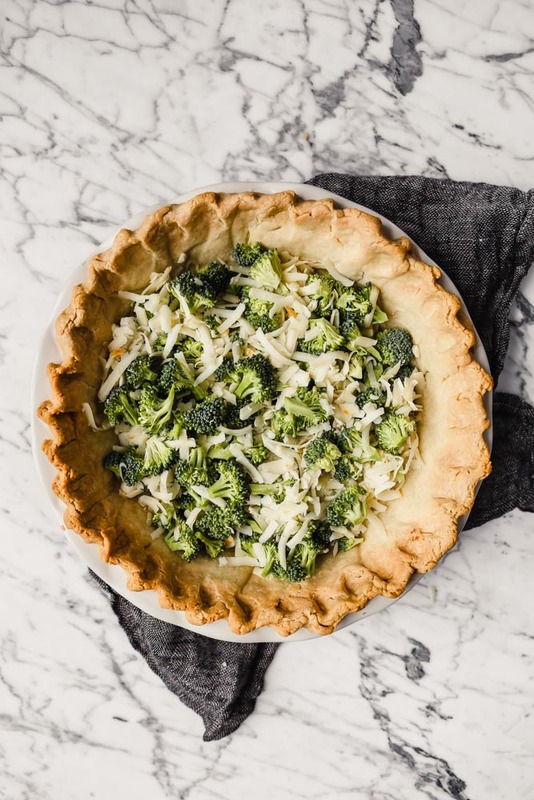 This Easy Broccoli Cheese Quiche recipe is just what you need when you’re planning to feed a crowd. It’s easy to prep, mostly hands off, and will satisfy everyone. 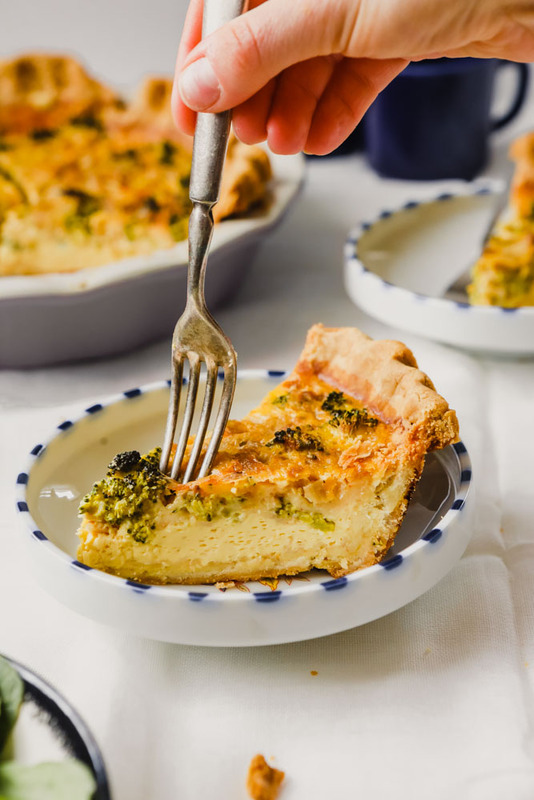 To lighten up the whole shebang, this Broccoli Cheese Quiche is made without cream and uses milk instead. For this simple recipe I use whole milk, because although we’re cutting back on the fat from the cream, we don’t want to cut out all of the fat. And for a creamy, flavorful custard I use two types of cheese; sharp Cheddar for flavor and Muenster for creaminess. However, if you don’t want to seek out two types of cheese, you certainly can use just one variety. Coming up with breakfast or brunch ideas when entertaining can be job. You don’t want it to be too much work, and if it requires a few steps, they’re preferably steps that can be done in advance. You want it to come together quickly, because who knows when people will start rolling out of bed, and most importantly, you want it to be versatile and appealing for most everyone. 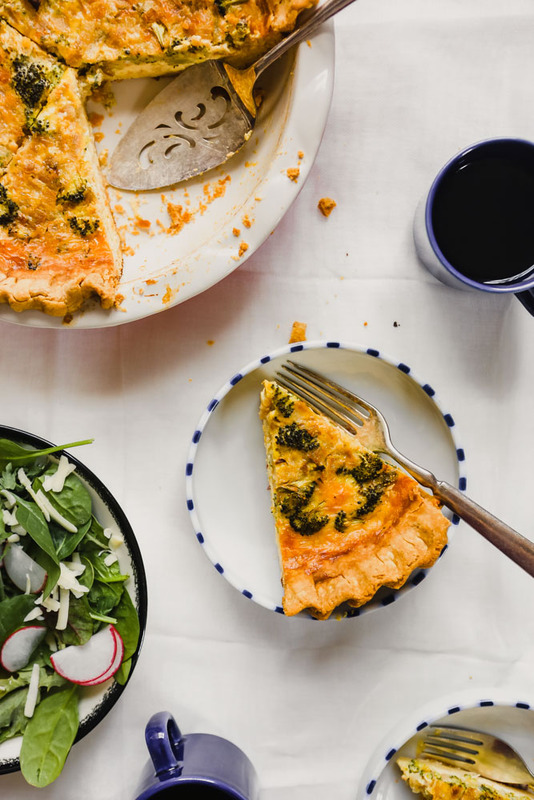 A simple quiche is without a doubt one of the best answers to all of those brunch-related concerns. 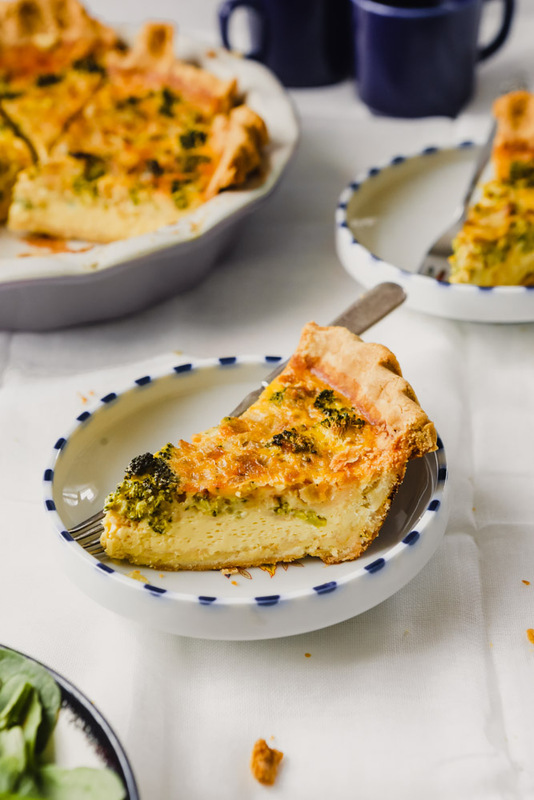 Especially this easy Broccoli Cheese Quiche. It’s elegant yet simple enough to appeal to kids, can easily be paired with a variety of side dishes, and can be prepped or completely made ahead of time. 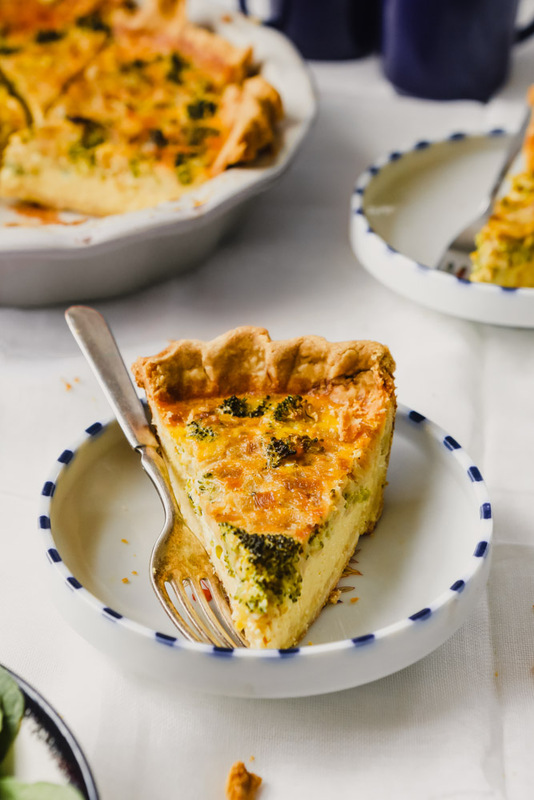 Quiche is something that takes some time to cook. It’s not labor intensive or overly hands-on, but it does require a bit of time in the oven. Because of that, I often like to make quiche a day in advance so when brunch rolls around it’s a quick, no-stress process. Lightly cover quiche with foil. How do you know when quiche is done? 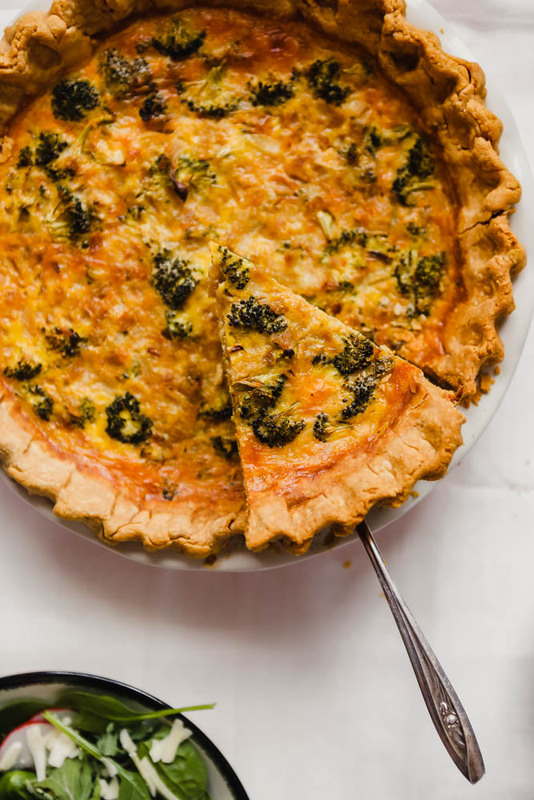 There are a few things to look for when determining if a quiche is done cooking. First off, the edges of the custard should be set and the center should still be slightly jiggly—this is important! In order to achieve that delicious, creamy center you want to avoid overcooking the custard. Secondly, you can employ an instant-read thermometer. 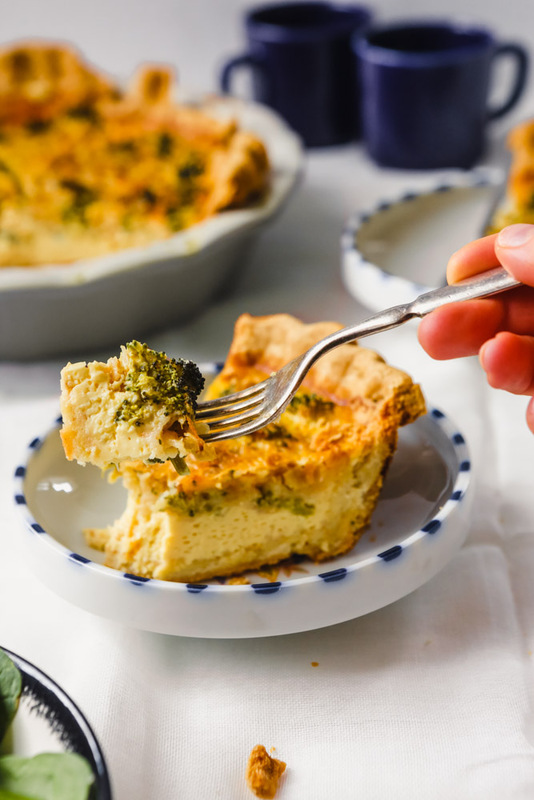 Quiche is cooked through when a thermometer inserted in the center, but not touching the bottom, registers at least 165°. I love, love, love my ThermoWorks Thermapen. If you don’t have one and are willing to invest in one of THE most important pieces of kitchen equipment, then I highly recommend getting one. Bake crust until edges are golden brown, and bottom is set 40–45 minutes. Remove parchment and baking weights, and bake until bottom is golden brown about 15 minutes more. Meanwhile, cook onions in oil over medium heat in a nonstick skillet until softened and starting to brown, 5–7 minutes; let cool slightly. For the custard, whisk together eggs, milk, salt, pepper, paprika and nutmeg until thoroughly combined; stir in onions. 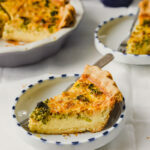 Combine broccoli, Cheddar and Muenster then sprinkle into bottom of hot crust and pour custard over top. 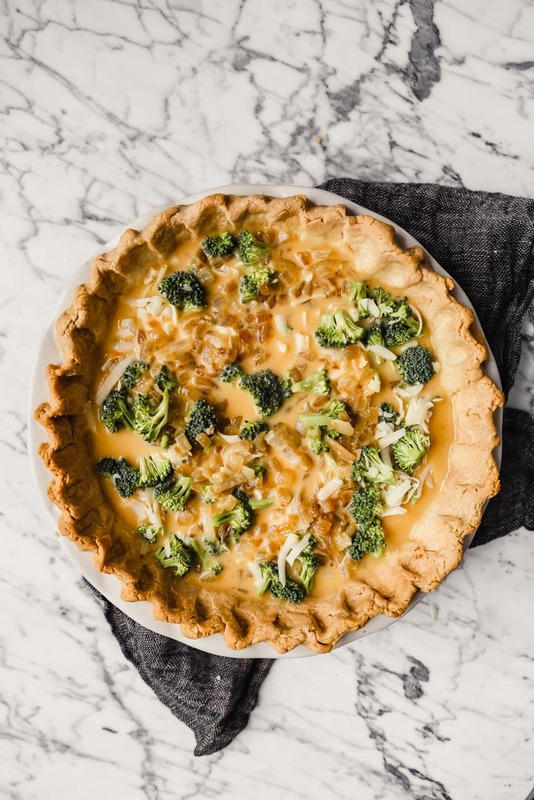 Bake quiche until edges are set and center is slightly jiggly, 1–1½ hours (if crust edges start to get too brown, use pieces of foil to shield them). Let quiche cool at least 2 hours. This post contains affiliate links. They are at no cost to you but they help support all things ZK!